Ken, a Las Vegas fire fighter, discusses his life-changing ankle stabilization surgery and why he travelled so far for treatment at UFAI. Many people complain of a wobbly, unstable ankle with chronic pain and swelling and recurring turning of the ankle when walking, running or even standing, which leads to further injury. It can be a maddening and painful cycle. Chronic ankle instability is often cause by an acute ankle sprain that didn’t heal properly. Ankle ligaments are stretched or torn during a sprain. The majority of ankle sprains effect the lateral ligaments (lateral ankle sprains ae the most common sports injury) and without proper rehabilitation the ligaments can be weaker or stretched out when they heal. This can lead lead to recurrent ankle sprains. Each additional ankle sprain results in further weakened ligaments and a greater chance of developing ankle instability. Chronic ankle instability is truly a complex of three possible issues including ligament tear and laxity, peroneal tendon tear and possible cartilage damage. These three issues need to all be considered as part of a triad of chronic ankle instability issues. MRI, ultrasound and physical examination are used for the diagnosis of these conditions and our results of over 2000 cases has shown over a 98% complete resolution of symptoms and return to pre ankle injury level. Dr. Baravarian discusses chronic ankle instability and the treatment options available at UFAI. State-of-the-art treatments such as PRP and stem cell therapies can assist the body in literally healing itself. When chronic ankle instability doesn’t respond effectively to conservative treatments, you should discuss ankle surgery options with a qualified ankle surgeon. 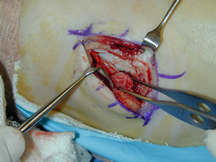 Our surgeons are Innovators in athroscopic ankle tendon repair surgery. In a method coined the "UFAI Triad," scar tissue is removed and the ankle joint is “cleaned up” through two tiny 1 cm incisions. Our surgeons have greatly improved the type of anchor that is used to tighten the ligaments back to the bone at the site of ligament tear. This improved anchor not only allows for a more structurally solid repair but also decreases recovery time by more than a month. In cases of severe ligament laxity or damage, we use the InternalBrace for added stability and structure to the repair. InternalBrace is a tiny, thick, rope-like fiber that’s stronger than the natural ligament. The fiber is secured into place by an anchor that is designed to allow blood and bone marrow to circulate through the device. InternalBrace tightly joins the torn ligaments together to strengthen the repair and increase healing time. When their job is done, the fiber and anchors biodegrade and reabsorb into the body. We are also one the few clinics that incorporates regenerative medical techniques into surgical procedures. By infusing amniotic and stem cells in the tendon surgery, we are able boost the healing process and further decrease recovery time. Our surgeons are passionate about treating chronic ankle instability. They have performed thousands of ankle ligament injury and tendon repair surgeries and our success rate is one of the highest in the country. Over 99% of our patients return to full and unrestricted activity following ankle instability surgery. Patients are our number one priority. Beginning with the ease of making your appointment, our family friendly office staff is with you every step of the way. We have our own x-ray, MRI, CT and musculoskeletal ultrasound at our facilities. We also offer orthotic and brace manufacturing as well as on-site physical therapy services and state-of-the-art operating rooms. This means you will rarely have to go from one specialist to the next, cutting down on your travel needs and wasted time. While most orthopedic surgeons focus on all the bones and joints in the body, only spending a fraction of their time on the foot and ankle, UFAI's surgeons choose to treat foot and ankle conditions as their lifework. Podiatric foot and ankle surgeons concentrate exclusively on the foot and ankle from day one of medical school. After medical training they begin a rigorous three year surgical residency. What sets podiatric surgical residents apart from general orthopedic residents is they specialize on the foot and ankle while most (though not all) ortho residents do not. Years of training and decades of experience and research is why the foot and ankle surgeons at UFAI have the highest success rates in the United States, literally helping thousands get back on their feet and back to their life.